For 40 years OKS Spezialschmierstoffe GmbH has been active as a lubrication specialist operating worldwide. Through its dealers selling engineering supplies and mineral oils, OKS is able to reach both commercial users and industrial customers. Continuous training and instruction of trade partners ensures that excellent consulting support and problem-solving expertise is available for customers locally. Longevity and cost efficiency of the lubricants used are guaranteed thanks to a modern product spectrum and the continual expansion of the range of products. 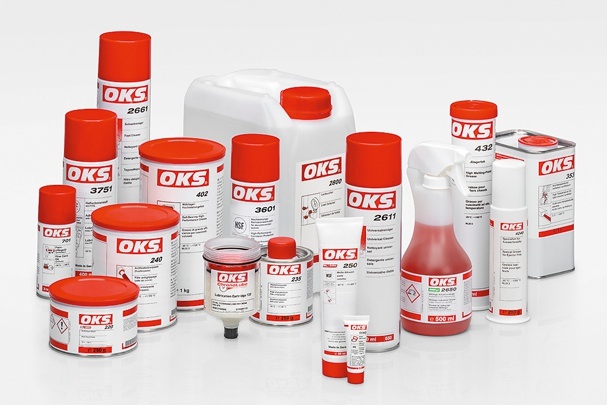 OKS produces and sells around 150 standardised, high-performance products to reduce friction, wear and corrosion. The main field of use for OKS speciality lubricants and maintenance products is industrial maintenance, repair and operations. The products developed by OKS engineers and technicians are produced at the company’s site in Maisach, near Munich, under strict quality and environmental requirements. From this site worldwide distribution of OKS products is also carried out. Since 2003 OKS Spezialschmierstoffe GmbH is owned by Freudenberg Chemical Specialities SE & Co. KG, part of the Freudenberg group of companies. - Sophisticated logistics: For a global delivery "just in time"